Over the last three decades, I’ve been using known economic and demographic trends to predict major economy and market shifts with uncanny accuracy. 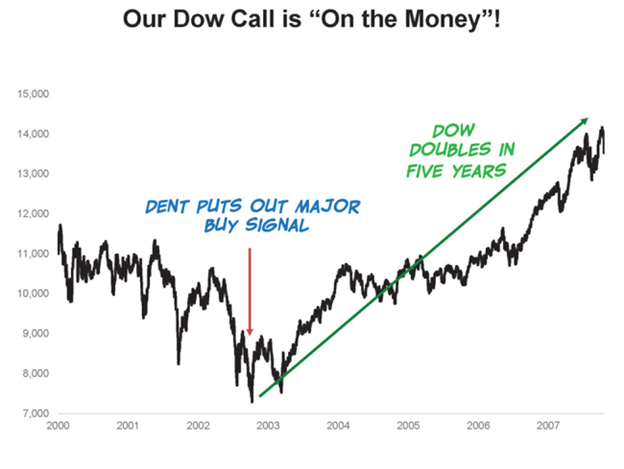 If you know my work – and that of my firm, Dent Research – you know we’ve helped a lot of investors save money and become wealthy by accurately forecasting major economic events over the last three decades. And just recently, we called oil's shocking crash, the dollar's surprising rise, and the collapse of gold in 2013 when it broke below $1,525. I’ve been staunchly predicting that the great China bubble will burst after the greatest real estate collapse in modern history. 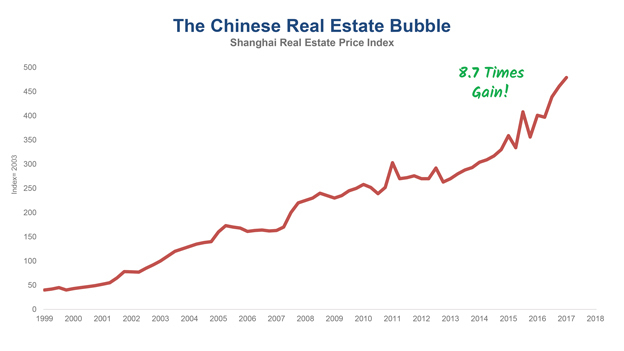 I’ve been staunchly predicting that the great China bubble would burst, which has already happened with much more to come in the greatest real estate collapse in modern history. But Today, I'm here to tell you about a major prediction I'm forecasting that could begin to take place as early as the next few months. The Dow's catastrophic plunge all the way down to 6,500 or as low as 5,500. This is one of the most specific and widest-ranging predictions I've ever made. But it won't be the first time I've been "on the money" with my big picture forecasts. In my first book, self-published in 1989, I warned that the economic boom in Japan would end, setting off a 12- to 14-year downturn. I made this forecast at a time when economists were predicting Japan would overtake the U.S. economy. Around the same time, I predicted the U.S. economy would struggle with a "short but sharp" recession between 1990 and 1992, before embarking on one of the greatest economic and stock market booms in American history, with a Dow of 10,000 by the early 2000s. Do you know how crazy people thought I was back then? I not only called the top of the 2000 tech markets in early 2000, but also issued the strongest "buy signal" of our 30-year history in October 2002... as I saw the DOW soar from 7,200 to 14,280 over the next five years. Then in September 2005 I warned that the real estate bubble looked like it was peaking. The crash started just a few months later, in early 2006. That’s when I moved from Miami to Tampa, rented a home and saved myself from massive losses. In other words, I eat my own cooking. These and other forecasts are all a matter of public record – either through the best-selling books we publish or through other Dent Research publications. And as you'll discover a little later in this presentation, such forecasts were easier to predict than you might ever imagine! But I'm not talking to you today to brag about our past successes. I reference our forecasting success because our research tells us we’re now in an economic cycle that will almost certainly greatly impact your life, your family, your business and your investments for the next 3 to 5 years. Much of the Main Street media and many Wall Street pundits want you to believe that we’ll never see a crash or recession again. That’s why I’ve prepared this urgent presentation. In short, there's a “perfect storm” of economic and demographic realities brewing that will likely make the rest of this decade one of the most trying times in U.S. economic history. Unemployment will rise again as the work pool continues to shrink and companies lean towards employing people with experience (something students entering the workforce obviously lack). Housing prices will start to fall again, by as much as 40% to 50%-plus over the next several years. 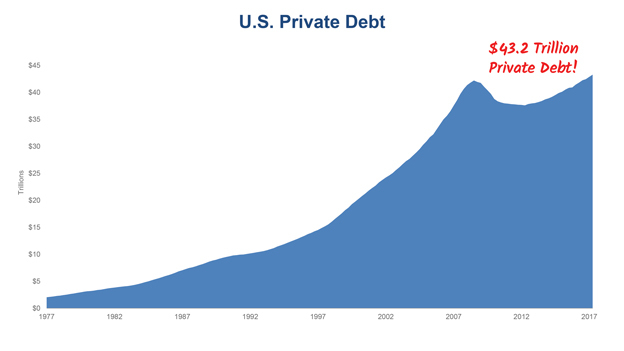 Still saddled with high private debt ($42 trillion at the height of the credit bubble – an estimated $140,000 for every man, woman and child in America), falling income and no equity left in their homes… personal bankruptcies and property foreclosures will resurface. Faced with huge revenue shortages and sharply rising social costs, the federal deficit will balloon to as high as $1.5 to $2 trillion. The crisis in Europe will resurface. With Greece still down, the Spanish real estate bubble will burst again, and as more and more European Union member countries will slip inexorably over the demographic cliff, especially mother Germany. Despite the lessons learned in 2008, mortgage companies and financial institutions have resumed risky lending practices and increasingly risky investments, which will lead us straight back into a second financial crisis, with no bailout likely this time. 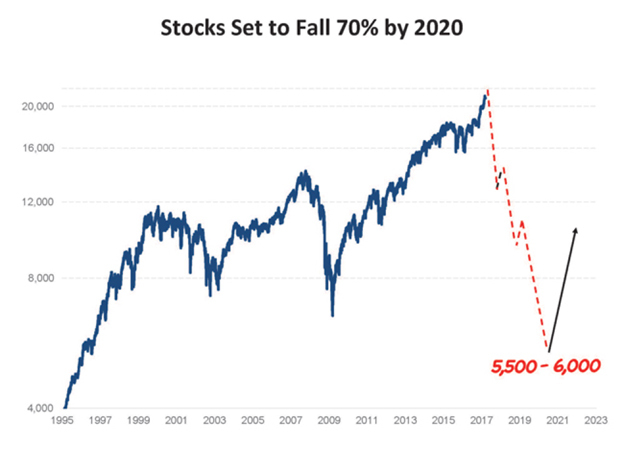 As government, corporate and personal spending dries up, the Dow and other indexes will tumble as much as 75%… reaching a 6,000 or a bit lower by 2020. But this scenario was practically preordained – as far back as the mid-1990s when the bubble in stocks began and real estate followed and Baby Boomers were heading for their peak spending years into 2007. I'll explain why and how all this will come to pass in a moment. But please also understand that there's a tremendous upside to what will unfold over the next several years and beyond. After all, when you're able to know what's coming – and position yourself accordingly – the years ahead could be very prosperous times. In fact, we’ll see the greatest “sale” on financial assets of your lifetime – as it occurred in the 1930s. Retire in luxury, with enough money to live like a millionaire and leave a "legacy of wealth" to your children and heirs. In short, you'll have an opportunity to transform your financial life faster and more radically than during any boom market. I take no pleasure in telling you what's in store for America and the stock markets in the months ahead. I'm not a "doom and gloomer" by nature, nor in my professional work. I was the most optimistic economic forecaster since innovating my best indicators back in the late 1980s. I have no political or economic axe to grind. A Harvard MBA graduate, Fortune 100 consultant and new venture investor who, with the help of the research foundation I created, discovered a powerful and incontrovertible link between the science of "generational analysis" and what the markets are about to do next. A phenomenon that follows the predictable spending habits of everyday people who drive our economy, not government tinkering. I'm simply following what I know from our research, and the historical data behind it, to its logical conclusion. 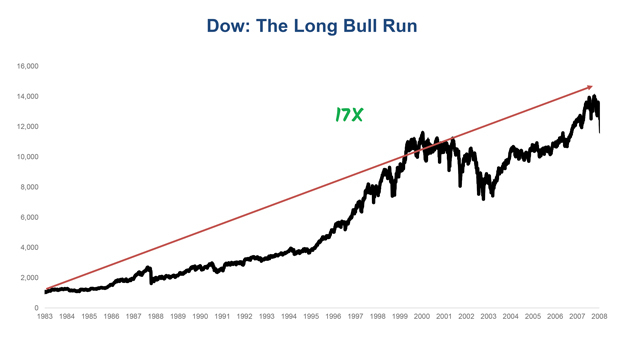 Believe me, it was much more "fun" when I correctly forecasted the greatest and longest "bull run" in stock market history in my 1993 book The Great Boom Ahead. In it I said the Dow would soar from 2,900 well into five figures over most of the coming decade… that cheap credit would spur one of the greatest real estate booms in decades… and that innovations, especially in information technology, would create more opportunity in the decade ahead than anything we'd seen since the industrial revolution. A lot of people thought I was crazy back then. As you probably recall, 1993 was not a particularly "rosy" year. We were just emerging from a very rough recession where unemployment had nearly doubled. Iraq's attack on Kuwait had sent oil prices soaring and the U.S. to war. The S&L crisis was rocking the credit markets. Housing prices were a bit weak. Consumer confidence was severely shaken. Japan had just seen a massive downturn with stock and real estate bubbles bursting... which I predicted in 1989 would happen. Not the best time to be calling for the greatest bull market in history. And anyone who listened and ventured full bore into the stock markets back then could have become millionaires many times over by the end of the decade... particularly those who invested in the technology, financial, and health care sectors we said would drive this unprecedented economic expansion the most. It wasn't the first time our research proved true. In 1988 I predicted the very 1990 to '91 recession I'm referring to – the one that would serve as the lifting point for the greatest bull market boom of the century. Around that time we also predicted a 12- to 14-year slowdown in Japan's red-hot economy. Again, people said there was no way Japan's sizzling economy could fall that hard and that fast. 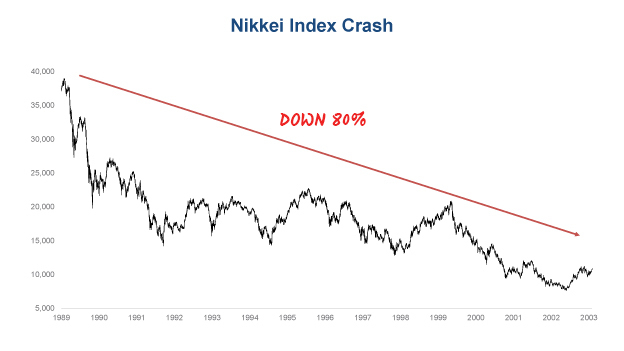 In 1990, Japan's economy went into a much-documented free-fall, as real estate prices tumbled 60% and the Nikkei plummeted from 39,000 to 7,831 – 80% – over a 13-year period! Incidentally, that's roughly the percentage drop my research tells me the DOW could face ‑ from its soaring highs down to 6,500 or as low as 5,500. 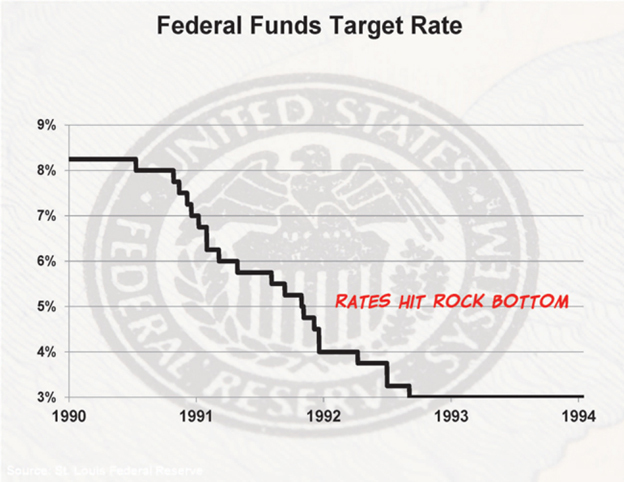 The Fed's best efforts won't prevent the slide to the bottom. Ultimately, in the next and most dramatic crash, we'll see lows of 5,500 on the Dow. But in 1999 the Clinton administration announced a surplus of $122 billion, followed by a $230 billion surplus in 2000. I warned on several occasions in late 1999 and early 2000 that the Internet bubble was "weeks away" from a serious correction… but also that the bigger boom was not over and would continue for the better part of the decade following the inevitable correction. 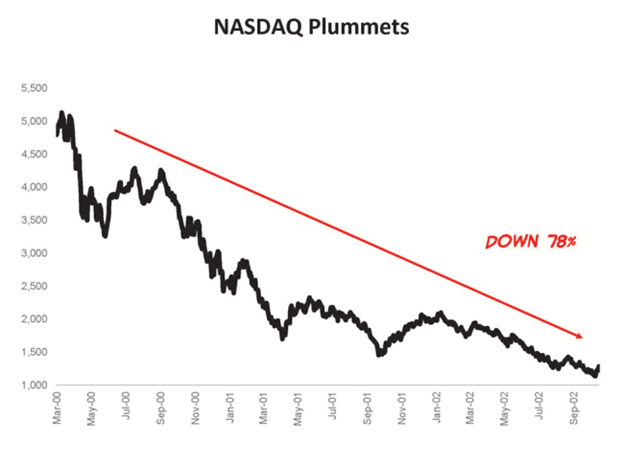 Trillions in stock market wealth vanished when the Nasdaq tumbled from its 5,050 highs down to 1,100 in late 2002 (78%)... before resuming its upward trend again in 2003. This predictive success was not some fluke or "voodoo magic". I claim to have no crystal ball or special powers. What I do have, however, is a firm grasp and understanding of the economic, demographic, and historical trends that made these events virtually preordained. 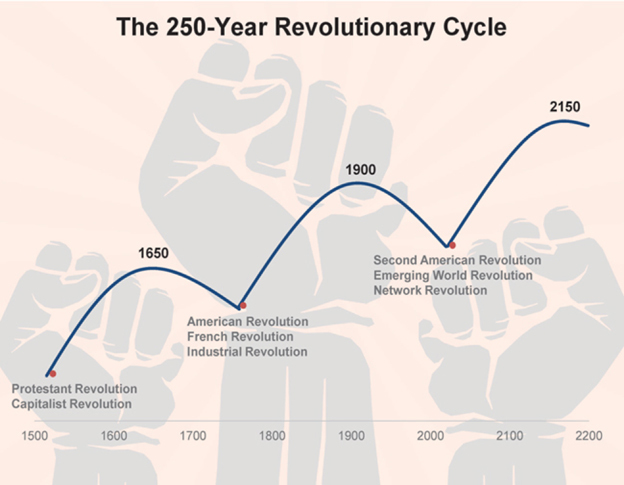 Every 250 years or so we see upheavals in nations and institutions – like the American Revolution and Industrial Revolution or what’s happening today in Eastern Europe, the Middle East, and the emerging world – that lead to greater freedoms and human rights, and will expand our freedoms in the developed world as well. That the early parts of most decades start off weak, even in boom times and the hidden indicator I’ve discovered from this is predicting a major financial crisis between now and 2020. When you know these things – and apply good science to it all – it really is amazing how clear the future becomes… and how wealthy you can become knowing it. I think you’ll be not only convinced, but amazed too. I think you’ll be impressed at just how prophetic my timing has been – using as my basis, a powerful indicator that many economists and most investment experts still dismiss as “secondary” at best. That these things don’t matter! When Baby Boomers – the biggest generational tsunami in our history – descended on the workforce en masse between 1957 and 1978, they set in motion a series of economic events, like massive inflation, so predictable that anyone who followed them could have become millionaires many times over. Because young people are expensive to raise and incorporate into the workforce. 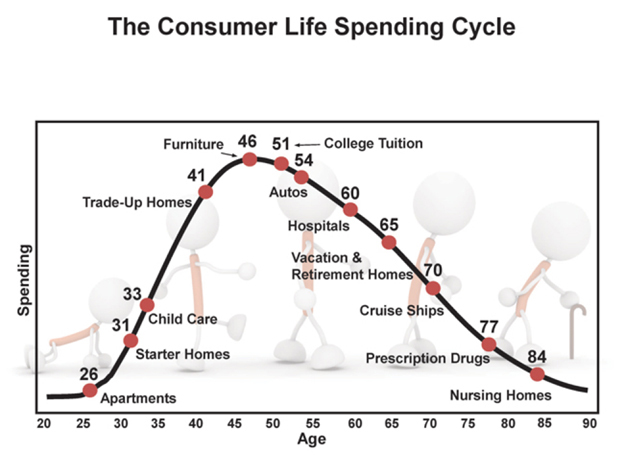 When they finally enter the workforce they create a massive spending cycle that peaks at age 46 for the average person. That’s why almost all the purchases of homes occur between the ages of 27 and 41. It’s also why spending on cars peaks at age 53. Now these very people, whose earning and spending and innovation fueled the greatest economic boom in history, are about to trigger a second big economic recession, actually a depression... another long slowdown marked with deflation, as they save and retire. Around 2008, without much fanfare, the last of the Baby Boomers moved out of their peak spending years. They’re no longer in the market for fancier cars, big homes, furniture, appliances, and all the other stuff that fills them. Instead, these people are winding down their lives. They're starting far fewer businesses… creating virtually zero jobs… and – here's a biggie – paying far less taxes in the coming years. In short, they've essentially stopped spending as much on the things that drive economic growth: housing, cars, furniture and other big ticket items. The last of the big spenders are either retired or they're saving for their retirement years. Of course when you combine this demographic-economic reality with everything else happening with the economy – unprecedented debt levels, currency volatility, shifting economic power bases, and the fact that we’re on the tail end of one of the greatest technological eras seen since the industrial revolution – it paints a troubling picture for the years ahead. Many investors will make the mistake of thinking the economy is humming along nicely... that the bull market will continue to charge upward. Instead, when that final trigger fires, which I believe will be in four to five months or less, everything will unravel. Markets will wind down week after week, falling through the 20,000 mark in the Dow. Down past 12,000, then 10,000, 8,000… all the way to 5,500. Only then, when the next major generational trend cycle begins to unfold from 2023 forward, will the market make its next major move higher. Only this time, developed countries like the U.S. will not be as dynamic and powerful as they were during the 1983 to 2007 boom, while countries in the emerging world will heat up in varying timeframes. 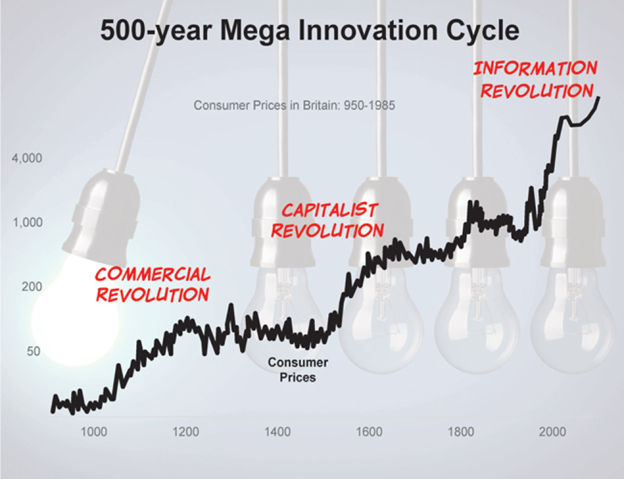 As history has shown, these economic trends are virtually set in stone. They are as certain as the DNA with which we were born. The greater the boom, the greater the excesses tend to be and the longer it takes to shake them out of the system. Excesses from a housing boom that drove prices up 130% in six years… with very little increases in incomes. Excesses from years of government over-spending – including the tens of trillions of dollars spent on wars, stimulus plans, corporate bailouts and quantitative easing. 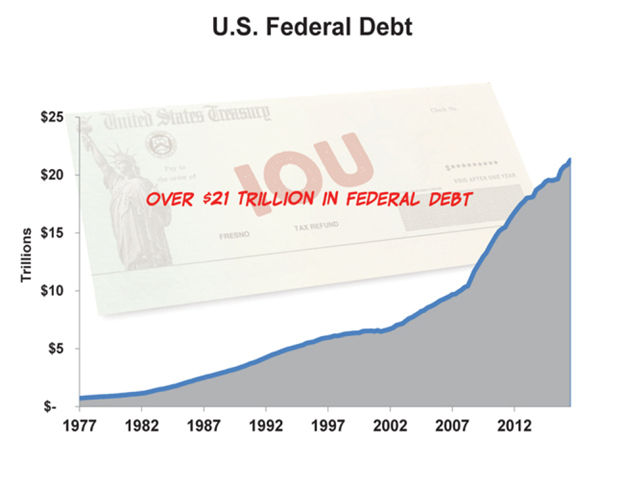 Private debt that mushroomed from $20 trillion to $42 trillion in just nine years from 2000 to 2008, dwarfing the massive government debt… Today, we’re sitting at $43 trillion! Entitlement promises that were $66 trillion underfunded by the Federal Government at last count…and another $8.2 trillion in debt when you include municipalities. In fact, total debt globally has grown to $217 trillion, much of which is in emerging countries that are still hurting from low commodity prices... another trend we predicted years ago. You’ve got to admit, that’s an enormous burden to shake out. Not only can you protect yourself from what’s ahead… you can make fantastic profits too. Some of the greatest fortunes in history were made not in boom times, but in down economies… by people who understood exactly what was going on. The Kennedy fortune was made that way… by selling stocks at the top in 1929 and then buying up cheap companies and assets during depression-era America. Even Warren Buffett launched his career that way… buying stocks on the cheap in the 1970s when nobody else had the stomach for it. The point is, when you can be confident about where the future is heading – when you know with certainty which markets and investments will be impacted – there’s no limit to how much money you can make. 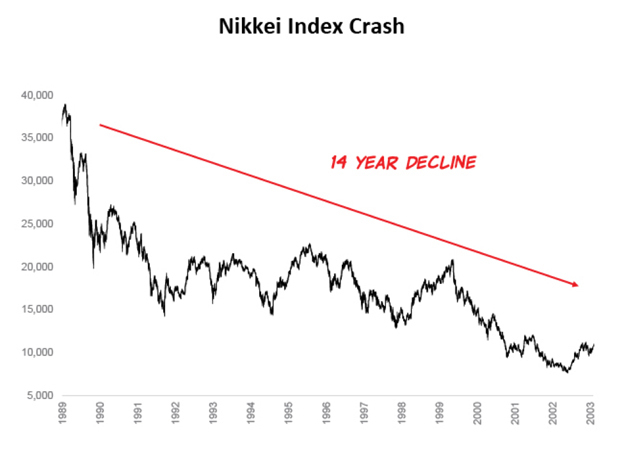 Had you shorted the Nikkei year after year, you could have made a small fortune. 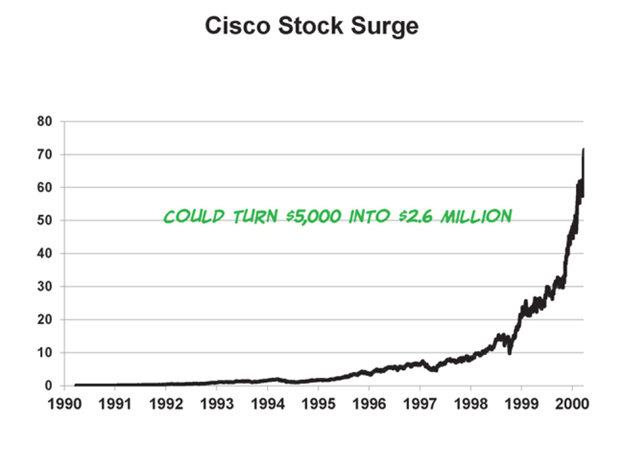 What if, during the depths of the 1990 recession, you began dishing money into the stock market in anticipation of our predicted bull run, focusing on established players in information and communications technology… companies like Microsoft, Cisco, and Dell? 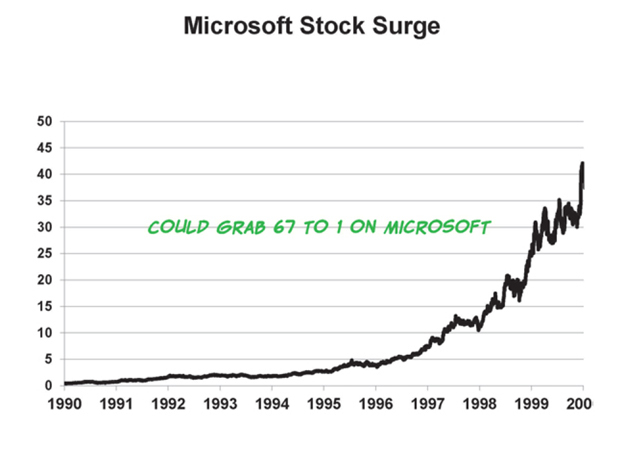 Back then you could have bought Microsoft, already a household name, for 85 cents a share (after factoring in splits), and watched it rocket to over $58 a share… that’s more than a 67-to-1 windfall. 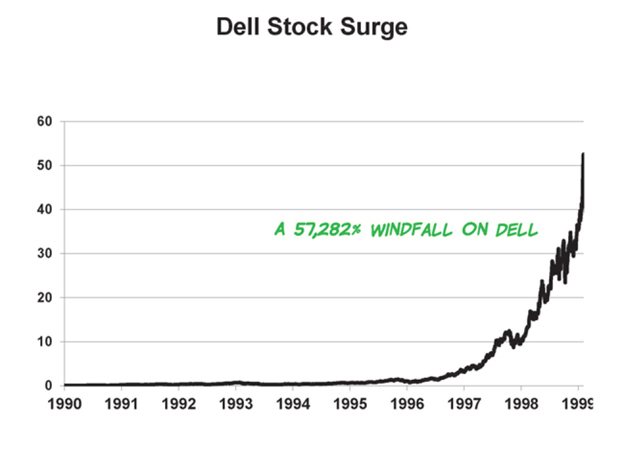 Dell Computers could have returned you a staggering 57,282% for those who bought and held until my warning… turning $10,000 into more than $5.7 million. What a lot of investors don’t realize is you can make great fortunes in a down economy as well. The secret is knowing what’s coming and when it’s coming… and then preparing yourself accordingly. That's the power of good research. That’s why I believe the message I’m sending you today is one of the most important you’re likely to hear in your lifetime. I’ll show you concrete ways to profit, including a little “insurance investment” you can make right now that will cost you a few hundred dollars, but could make you wealthy as the markets fall to my predicted targets. Economists, financial pundits, even government policy makers, rarely talk about the most important cycle driving modern economies like that of the United States and other developed nations. New generations come along about every 40 years. And members of these generations move along a predictable life cycle of earning, spending and productivity. We get married at around age 26 and have kids around the ages of 28 and 29. We enter our peak spending phase – the period in our lives when we tend to have the most disposable income and treat ourselves to cars, gadgets and so on. It actually peaks at age 46, but spending remains fairly high into age 53 before it falls off more dramatically. A dramatic effect that will be felt across the country in the coming year. We see retirement not far off and make a concerted effort to save, while our spending needs decline as our kids leave the nest. We retire at age 63 (on average) and tend to have our greatest net worth at age 64 – cash, investments and assets we’ve set aside to live on. Knowing this, we’re able to see, decades in advance, what impact up-and-coming generations will have on the economy, different consumer sectors and the markets. And when you have a generation the size of a pig in a python, you know that the inevitable booms and busts ahead will be monumental. 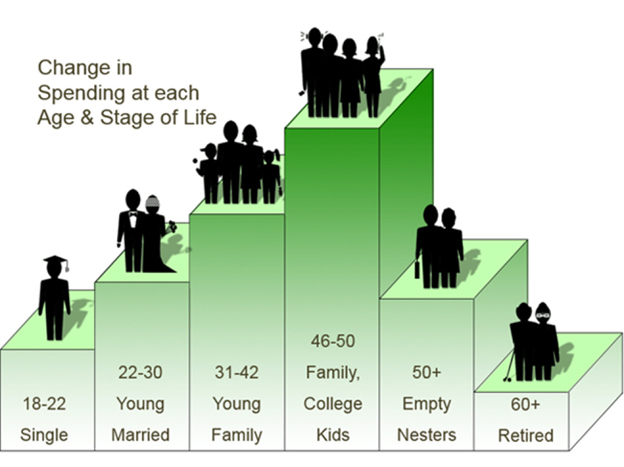 As you can see from the chart below, the Baby Boomers are no ordinary generation. It peaked at nearly five million births per year (when we adjust for immigrants) between 1957 and 1961. To forecast the greatest boom years, as this generation moves through its predictable spending patterns, you merely “skip ahead” 46 years. That’s when the average Boomer spends the most money. And you discover that the greatest economic boom in U.S. history was pretty much “preordained” to begin around 1983, right as the first of the Boomers entered their peak spending years (1937 plus 46 years)…and start to tail off after 2007, with the last of them moving onto their next spending phase (1961 plus 46 years). It rocketed from 775 in late 1982 to 14,280 in late 2007. That’s a massive 17 fold increase. Again, it’s important to understand that we knew – as early as the late 1980s when we developed the Spending Wave – that Boomers would experience a strong rise in their spending during this time, especially in the 1990s. All we had to do was trust the research and invest accordingly. Was this an isolated event? No. Look at the generation 40 years behind the Boomers, where the birthrate spiked from as far back as we can measure it in 1909 through 1921 to 1924 (the Bob Hope generation). Skip ahead 44 years (when spending peaked back then; it differs for each generation) and look how the Dow performed. 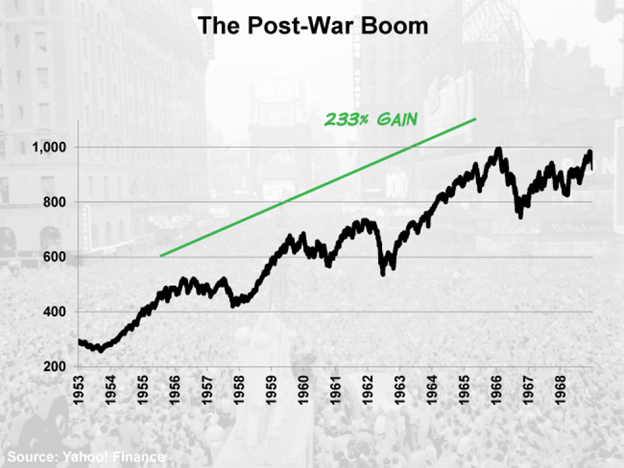 It soared from 280 in 1953 to 932 in 1968 – a 233% gain. The Dow pretty much traded sideways over the next 14 years… actually losing 100 or so points between 1968 and 1982… and at worst was down almost 70% adjusted for inflation. And a similar scenario is what we see ahead for the next several years… only worse, with a greater demographic decline in spending and a much greater debt and financial bubble to burst and unwind. The next five years will look more like 1930 to 1933! 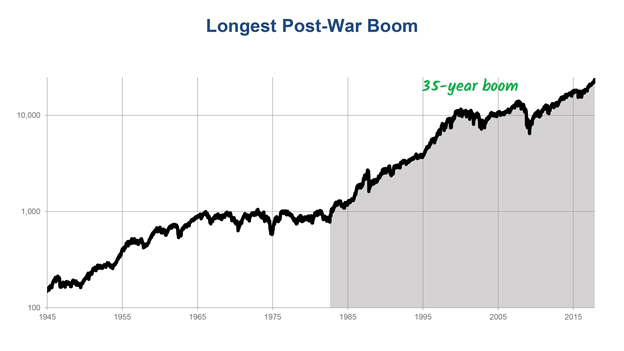 The last time this happened, the market didn’t start moving higher until after late 1982, when Baby Boomers started moving up their Spending Wave, earning and spending more. Based on the science of demographics, our economy was all but preordained to “turn” in late 2007, when the last of the Baby Boom generation passed their peak spending years. The economy will turn again as the peak wealthy Baby Boomers pass age 56 in 2017 and decline in spending even more rapidly (this is something we’re starting to witness right now and it will get more dramatic in the year ahead). The bubble created by this generation’s unprecedented surge in spending as they aged past 46 couldn't be sustained because the people who first drove the spending are now saving. Even worse, they’re no longer borrowing for big ticket items, an activity that leverages spending the most. Like all bubbles do, it had to burst! We saw that happen with the credit crisis and the stock market collapse of 2008. Of course, the government did what it thought it had to do. It intervened, pumping trillions into the economy... and after getting addicted to free money, the markets aren’t going to be happy when longer-term interest rates start rising as we’ve been predicting. But the government's stimulus effort hasn’t worked. Despite the trillions in "free money," we've only managed to eke out less than 2% growth on average. The reality is their efforts were doomed to fail, thanks to the slowing spending, high debt and rising savings of the largest generation in history! Americans will experience what the Japanese experienced when they saw their Baby Boom population peak 15 to 20 years earlier than our own Boomer generation. 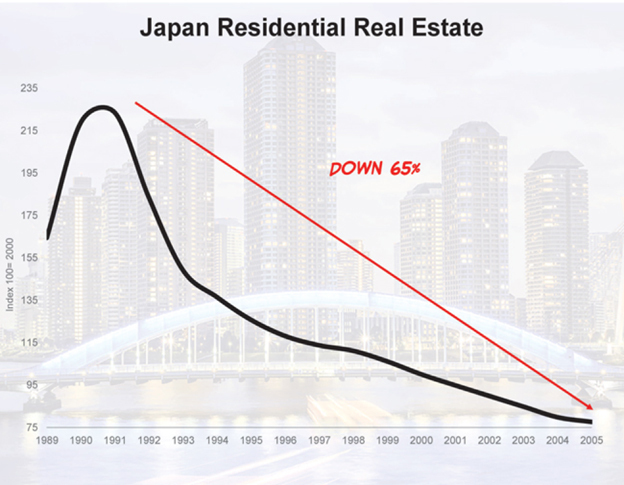 Japan’s stock market, real estate and economy declined for 14 years… just as we predicted it would back in 1988 and 1989. To make matters worse, many European countries experienced post war Baby Booms of their own. They too are experiencing the same generational shift in spending as we are and their peaks come a little later than the U.S. Germany, the strongest country in Europe has worse demographic trends in the next eight years than Japan did in the 1990s. Greece became the first developed country to default on their debt, Portugal and Spain are in a world of hurt, and Spain in particular is too big for any type of bail out. Italy is teetering on the edge as well. All of Southern Europe has terrible demographics for decades ahead with no Echo Baby Boom to fuel a boom to follow. China is ripe for a bubble bust, as the government built cities designed for a million people, yet have zero or near zero inhabitants… 27% of condos in major cities are estimated to be vacant… in fact they continue to build infrastructure they won't need for decades… they have massive excess industrial capacity – 30% to 50%... all to keep unprecedented levels of urban migration going and unemployment from soaring after their exports collapsed in 2008 and 2009. And yes, there will be ways not only to shield your money from what’s to transpire in the coming months, but to profit handsomely too. But first, there’s another truth to tell you about… something that will make this decade unlike any other we’ve ever seen. Truth #2: The Greatest Credit Bubble In Modern History Deleverages… Deflation, Not Inflation, Is Ahead. So many market forecasters these days are talking about inflation. In so doing, they’re missing the bigger danger: deflation! Ahead, we'll see a more deflationary environment as tens of trillions of dollars in loans and financial assets simply disappear faster than they were created in the bubble boom. Are you aware that there are more than $300 trillion in financial assets in the world: loans, bonds, and stocks. I estimate that at least $100 trillion of that will disappear. Fewer dollars in the world mean deflation, unless governments are going to create $100 trillion of new dollars (they only created $12 trillion since the last crash). I believe it's crucial you understand this. Because if you base your investments on the likelihood of coming inflation (like buying gold or other inflation-friendly investments), I'm afraid you could be wiped out along with everyone else. But if you know the real story, not only can you make a lot of money in the short term… you could have a rare opportunity to generate a family fortune once 2023 rolls around. History tells us that most severe downturns and depressions have three phases. A severe crash, like we saw in late 2007 to early 2009, when the Dow fell 55%, from 14,280 down to 6,440. That's followed by a market rally, spurred by renewed economic activity from government stimulus. That's where we are now. The third phase is a bigger crash, deeper depression, and a deflationary phase that lasts for several years. Most of us have experienced some kind deflation over the last few years, particularly regarding wages. 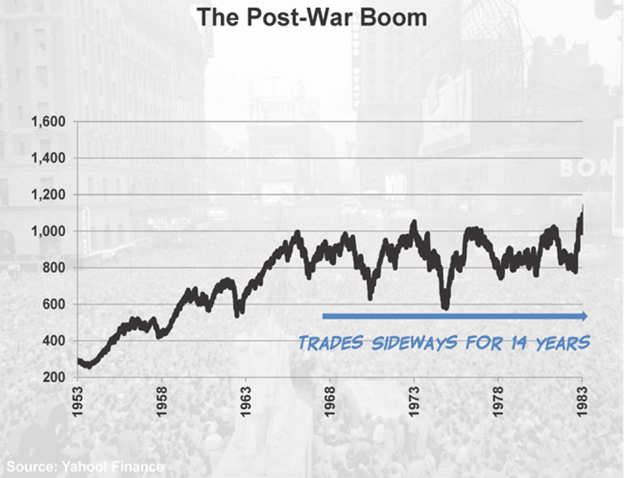 However, the last time there was substantial deflation was during the Great Depression, from around 1930 into 1933 and the economy didn't really recover until World War II and with the Spending Wave of the new Bob Hope generation. So what is deflation and how does it impact the economy? Deflation, as the name suggests, is the exact opposite of inflation. Inflation happens when there's a lot of available credit, free flowing money and strong demand for goods and services that is outpacing the supply from businesses. When everyone has access to money through easy loans and fast credit, the demand for "stuff" goes up. And when demand goes up, so do prices. With deflation, the opposite occurs. There’s too much supply of goods and services due to over-expansion. 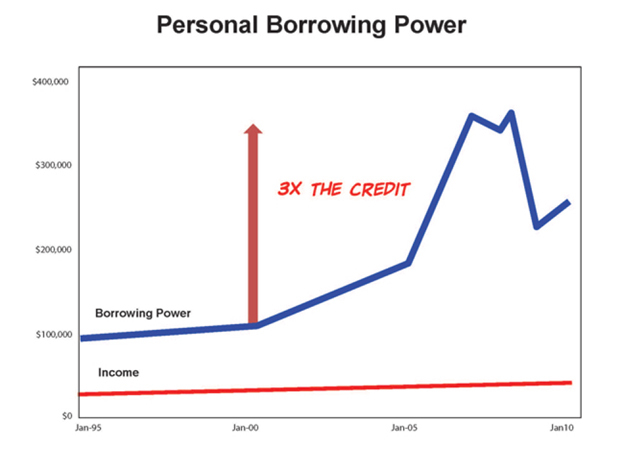 There’s less money flowing because credit tightens up, causing money to become scarce. Wealth through loans and financial assets evaporates. And because people have less money to spend, demand for goods and services go down. 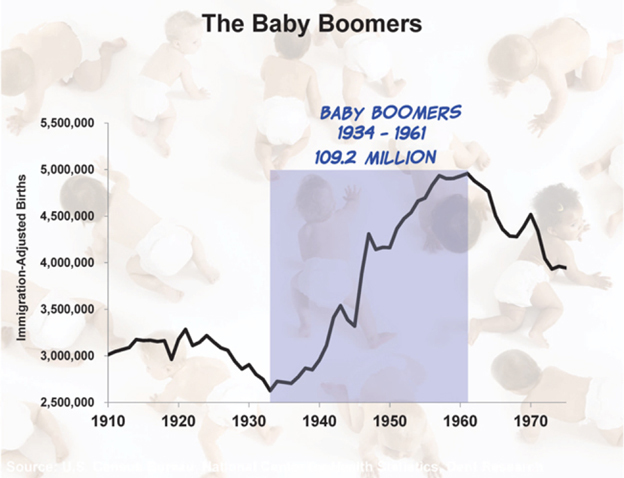 The aging of the Baby Boom generation will also cause demand to fall very substantially. And when demand goes down, so do prices. Of course, prior to 2008 there was plenty of money to be had by all, thanks to all the cheap credit that was available. In the credit boom we extended large amounts of money to homebuyers and homeowners in the form of Home Equity Lines of Credit (HELOCs), subprime loans, No-Income-No-Job (NINJA) loans, Option ARMS, Alt-As, etc. And a whopping $13.7 in consumer debt – mortgages, car loans, credit cards – that’s a total of $71.1 trillion! You can see on this chart that private debt was a bit higher at its peak in 2008, while government debt has risen substantially since 2008. 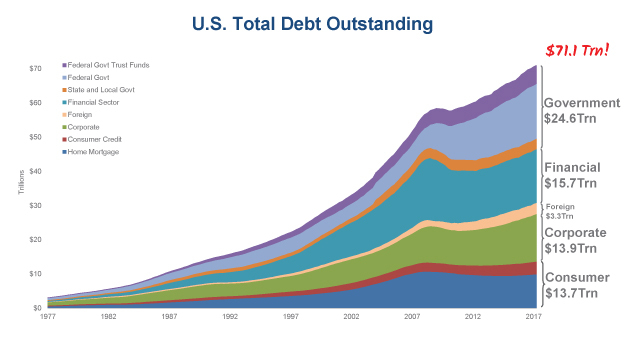 We are now actually $13 trillion more in debt overall than in 2008. And that $71.1 trillion doesn’t include the estimated official $46 trillion in unfunded liabilities for Medicaid, Medicare and Social Security. At last count, the best experts outside of the government estimate those unfunded liabilities to be more like $66 trillion and growing rapidly. Add it all up and that's $137 trillion in debt. Or close to $420,000 for every man, woman and child in America! Once credit bubbles go to extremes, they always burst and deflate… resulting in a sudden tightening of money supply (credit)… followed by deflation as massive amounts of debt are written off and financial assets from stocks to real estate crash, destroying massive amounts of money and wealth in a short period of time. It happened in the 1930s. It happened again in Japan in the 1990s. And because no government can counteract that kind of overwhelming debt with any amount of stimulus without making its currency next to worthless, it’s likely to happen as this economic cycle continues to unfold. I believe markets will peak in the next few months or so. And we'll see the next great crash wherein the Dow slides to 5,500 or a bit lower by early 2020 or so. We'll see bankruptcy rates escalate again, followed by a long line of bank shakeups (again). Banks will once again tighten up their purse strings and return to the stringent loan policies they implemented after the '08 collapse. Many will not lend at all. Instead they'll choose to hoard cash while it gains value (i.e., buying power) through deflation. Most will be very hard pressed to find qualified lenders to loan to, since a) so many borrowers' credit ratings are still in take a beating again and b) the housing market suddenly collapses again, one last time, leaving very little or negative equity to lend against. Less credit means less money in the economy. Less money means less demand for goods and services. Less demand means lower prices and less production. Less production means more plant closings and more job losses. Well, I think you’re getting the picture here. It’s all a domino effect. For those who don’t prepare now, the impact will be devastating. But if you see and trust that it’s coming, it’s an opportunity to make a lot of money… and we plan to tell you how to do that every step of the way, as I’ll explain in a moment. It’s also a very positive thing for the economy as a whole in the longer term. That’s because deflation helps to "shake out the excesses." It encourages a massive restructuring of debt, writing off of losses, trimming back of the supply chain, shifting of market share to the strongest and most efficient companies that can keep prices down in the future, and more. It’s a little like personal bankruptcy… or what’s called a Chapter 11 bankruptcy in business: painful while it’s happening… but once it's done you’re left with a nice clean slate, a lower cost of living, higher cash flow, and you’re ready for your next phase of growth. Most people don’t know this, but the stock market crash of ’29 wasn’t solely responsible for the Great Depression of the 1930s and ’40s. It was the failure of real estate…. The failure of farms in particular, where most bank loans of the day were extended. That was back when farms were the place where many Americans lived and worked. The tractor revolution made those farms much more productive. As demand for farmland and easy credit grew, more and more money was available and "loaned" against the escalating value of property and equipment. But when the bubble burst – as they always do – and farmers couldn’t repay their loans, the banks failed right alongside them. That’s what caused the “run on banks” the era is famous for. We’ve seen plenty of real estate bubbles in the past. 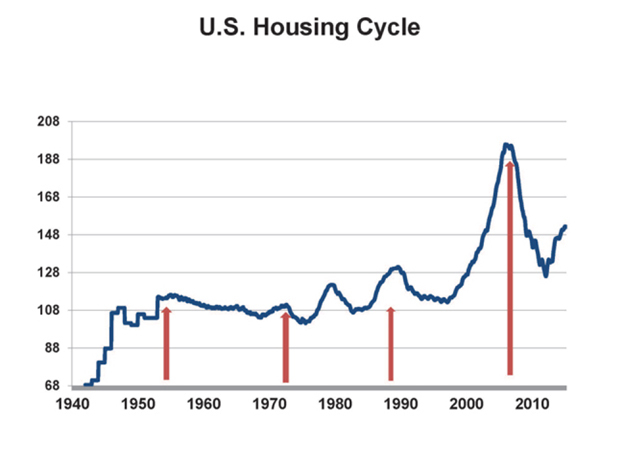 In fact, research tells us real estate tends to run in 17 to 18 year cycles… virtually without exception. We saw minor peaks in 1954, 1972 and 1989. But nothing like we saw in early 2006! Housing prices were already on the rise in the mid-1990s, thanks to an aggressive government-led “home ownership” policy that made it easier for people of all economic backgrounds to buy homes. It was no accident that housing prices rose even faster following the 2000 stock market crash. Not only were Baby Boomers well into their peak house-buying years, but huge flows of investment funds suddenly shifted out of the technology stock bubble that was crashing and into housing. Meanwhile with "Fed" easing and a slowing post 9/11 economy, interest rates plummeted to near-historic lows, making home affordability and speculation even more attractive. On top of everything, mortgage companies took full advantage of further deregulation by offering liberal financing with little money down and low "teaser" interest rates that would ratchet up three, five and seven years later. At the height of it all, it was entirely possible to walk into a mortgage broker with no job, lie about your income, sign a no-doc mortgage and be in a house you had no hope of ever affording! Banks went from lending at 3.3 times your income to 9.3. That’s nearly THREE times as much credit per household. As this artificial demand kept driving housing prices higher – an average of 15% per year compared to the historical 3% per year average – millions more people borrowed billions of dollars at the cheapest rates in history against the newfound equity in their homes. And things were great until early 2006, when it all started to unravel. Triggered by low interest subprime mortgages "resetting" to much higher rates, in just four states – Arizona, California, Florida, and Nevada – homeowners who could barely afford their "teaser rate" mortgages had no chance of covering payments that doubled and tripled. Thousands of subprime borrowers simply stopped paying. Foreclosures spiked into the millions. People abandoned their homes. Others destroyed them maliciously. Housing tanked. However, the real estate market has made a comeback. Prices are back up, interest rates are still low, and the market is hot once again. But it’s not sustainable. As home prices have risen, so have the taxes due. More and more people are finding it impossible to pay their property tax bills! Eventually, rising prices become self-defeating. And what about new homebuyers? Those 20-somethings entering the market? There simply aren’t enough people to replace the decline in Baby Boom demand and absorb the homes freed up in the market as they die. Plus the new, younger generation is much more cautious about buying homes, and spending in general, after seeing the last great bubble crash. It all means we could be mere months away from the next real estate collapse and it’ll be the final chapter of the biggest real estate shakeout in history. You see, one of the classic rules of bubbles, history tells us, is that they typically deflate at least back to where they started… and often a bit lower. That means housing prices will have to fall 55% to 65% from their early 2006 highs. They only fell 33% at the worst in 2012. 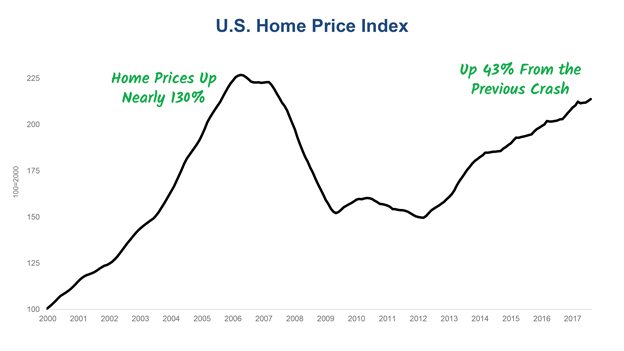 Home values could fall back to the prices they were in 2000, or possibly as low as 1996 levels! For one thing it means, if you're holding on to property with the sole expectation that it will go up by double digits, sell it now. And the greatest housing recovery will reverse, leaving everyday Americans wondering what hit them. Again, I want to remind you that I’m merely reporting to you the realities of our current economy… and the likely path it will follow for the remainder of this decade based on historical and empirical data. I’m not someone who has made a career of preaching doom and gloom. Had I prepared this presentation for you back in 1992 or '93, the last time my research forecasted an economic trend of this magnitude, I would have been telling you how wonderful and prosperous the next decade and a half would be. At the time, I was one of a very few economists predicting sunny days ahead. Back then the mood was very bearish. The markets had taken a beating with the crash of ’87, the junk bond scandal and then the S&L scandal. Top economic forecasters of the day – Lord Rees Mogg, Ravi Bhatra, Robert Pretcher, Robert Figgie and much of Wall Street – were successfully selling millions of books declaring the “End of America” as we knew it. Specifically, the enormous impact a spending force as vast and powerful as the Baby Boom generation would have on an economy… especially as they were entering their peak spending, earning and productivity years. That’s why I published The Great Boom Ahead. I went firmly on the record to say that it was NOT the “End of America” after all. Rather I said that, except for a few bumps and dips along the way, we were on the cusp of one of the brightest and most prosperous periods in our economic history! But now the next economic cycle is unfolding. I refer to it as “the Economic Winter Season” because it really is a time to hunker down and regroup… a time to "shake out" the excesses of the previous boom so that the “Economic Spring Season” can begin. Nature has an order of things. And as I’ve learned through my more than three decades of researching economic cycles and demographic dynamics, so do markets and the economy. Every cycle we have studied in history has four seasons, just like our weather. Think of inflation in "temperature" terms. That’s why I’m not worried about the years ahead. In fact, I welcome them. This is not “The End of America…” as some would have you believe. In fact, the events I describe are not only inevitable and necessary… they’re desirable. Because with any major shift in economic direction comes enormous profit opportunities. Get out of traditional stock investments now as it’s better to be a bit early than too late as stock bubbles burst much more dramatically than they inflate, typically 40% in the first sharp move down! Remember, the first order of business is to protect yourself and the assets you have. That means getting out of investments designed to perform in a bull market. Given the demographic cliff and the Fed's intended reduction of its balance sheet, the stock market, commodities, and real estate are all going to tumble again. I'm talking gold hitting $700 to $750 an ounce at a minimum by early 2020 or so and as low as $400 - $450 by early 2023. Real estate down by another 50%. And all of this over the next 20 months or so. I don't think we ‘ll hit the ultimate lows in most markets until late 2022, when our trends start to turn back up again. That's why I recommend putting as much into cash as soon as you can… at least for now. Because in deflationary times, cash is king. Because unlike what happens during inflation, money actually gains value when there’s deflation. It’s simple supply and demand. Money supply shrinks when there’s less lending and as debts are paid down and written off. As this happens, the demand for dollars will actually go up. That’s why, as strange as it might sound right now, and contrary to everything you might be hearing, the U.S. dollar (and dollar-based assets) will be the very best currency to own in the years ahead. They already have been since the crisis started in early 2008. 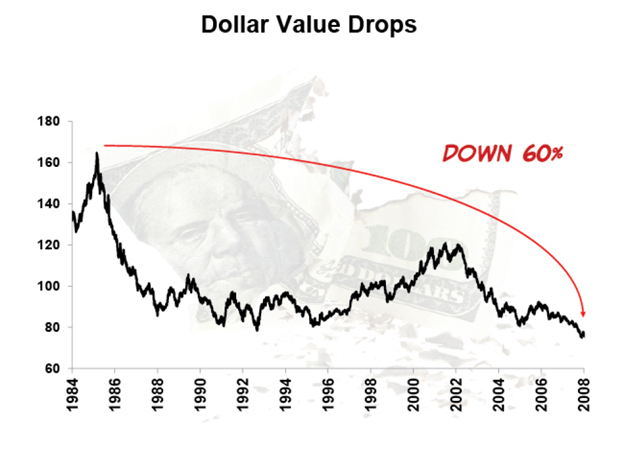 You see, we actually devalued and debased the dollar during the great boom and credit bubble from 1983 through early 2008 – a period when debt grew 2.6 times GDP for 25 years and the dollar fell 60%! Reversing this unprecedented credit bubble will destroy many loans and credit… it will destroy dollars, making them more scarce and valuable! Also, be ready to sell your gold, silver, and other precious metal investments in the not too distant future. We gave our strongest sell signal back in April 2011 on the day silver hit $48 and just a few months before gold peaked and started to crash as well. 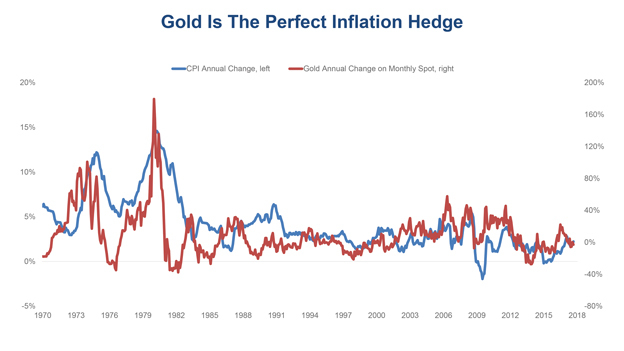 Gold and silver perform very well in inflationary times because they act as a hedge against inflation. 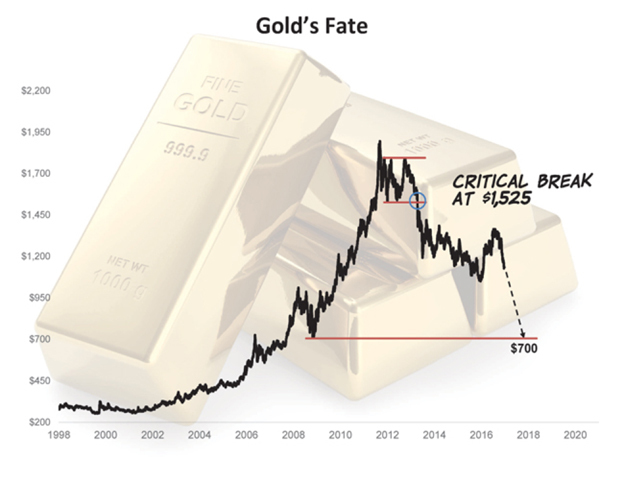 But when there’s deflation – and a strengthening currency – gold and silver prices will fall along with most other assets as they did in late 2008 when the crisis fully hit. If you happen to be holding any foreign currencies, convert them to dollars. By converting back to dollars now, it’ll be like buying a sure-fire investment at 10-year lows. If you have any real estate, strongly consider selling it if it is not strategic to your life or business. If the interest rate on your mortgage is higher than 6% and you have more than 20% equity remaining in your home, refinance now and lock in a low three or five year ARM rate (depending on the time left on your current mortgage). Do this before long-term rates spike. They're moving already, so you don't have much time to act. Number one, with housing prices destined to fall again, you may not have the equity to qualify in the future. And number two, there’ll be a time where any home loan will be very difficult to get. Also, take this opportunity to downsize your life. If you’ve accumulated a lot of stuff you don’t really need or use – cars, furniture, boats, and other toys – sell it now while there’s still something of a market for it. Not only will it give you more cash, you’ll be amazed at how liberated you’ll feel. (Plus, if you really want it – you’ll be able to buy it back cheaper two or three years from now). And look at the money you’re paying out every month. See if there’s a way to reduce any of it. Maybe there’s a storage unit holding a lot of furniture you're saving and it’s costing you a few hundred dollars a month. Sell the stuff and cancel the unit. Cut unnecessary expenses. You’ll be surprised how the money adds up. Keep in mind this is all about dollar accumulation and keeping more of the money you make. What about bigger purchases, like cars? If you have a reliable car, keep it for at least the next 18 months. If you need one, try to avoid buying this year. Buying now will only result in significant depreciation. Instead, lease it for two years – then buy new when the economy will be at its weakest and you’ll get the best rates and deals. Now I know I’m covering a lot here. And I realize not all of it applies to everyone. My advice to you is to do as much as you can to prepare. This isn’t just about penny-pinching or budgeting or necessarily preparing for some sort of global Armageddon. It’s about being more self-sufficient and financially secure. So shed inflated assets and high-cost debt… move stealthily into safer and more strategic investments and cash – cash you’ll later be able to parlay into outstanding profits after the next great crash. But how can you take advantage of the myriad of opportunities that will arise from the next crash? Here at my organization, Dent Research, we have a team of economists, demographers, researchers and investment analysts working diligently to prepare our members for what lies ahead. Many of our clients are financial advisors who count on our forecasts and guidance to help them steer their customers in the right direction. Many more who follow our research are regular investors who use my research to determine their investment decisions…. 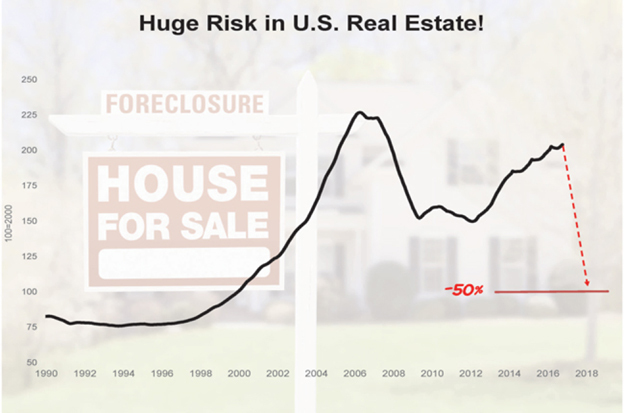 Like Virginia from Naples Florida, who credits the timely sale of her home to my warnings about the real estate market in October of 2005… she also got out of the stock market in late 2008 after I warned about the troubles there. Believe me… it’s very rewarding to see the important research we do recognized so positively by so many respected people. But our goal, first and foremost, is that our research be used to avert financial disaster and empower investors to profit from the many opportunities that arise during periods of profound economic change. I’ve already told you about many of the things you can do right now. But if you’d like us to be with you through this entire period – so we can point you to the best profit opportunities as events unfold – the best thing to do now is sign up for my monthly letter, which my team and I put together specifically to help regular investors like you prepare for this unavoidable change in season. It's called Boom & Bust and I’ll send it to you each month so you know everything that’s happening in real time… so you can see what’s coming next (and when)… so you can know where you should be moving your investments as events start to unfold… and so you can see some of the very best (and specific) ways to profit. I hope you sign on to get it because, frankly, my research suggests it’s about to get very bad out there. The truth is, it's in the best interest of most parties – the media, the brokerage community, Wall Street, corporations, and even the government – to have you believe nothing could go wrong. They'll go on TV and tell you that everything is humming along better than expected. That way you'll keep buying stocks and things you don't necessarily need. The problem is, my research suggests that's simply not the case. 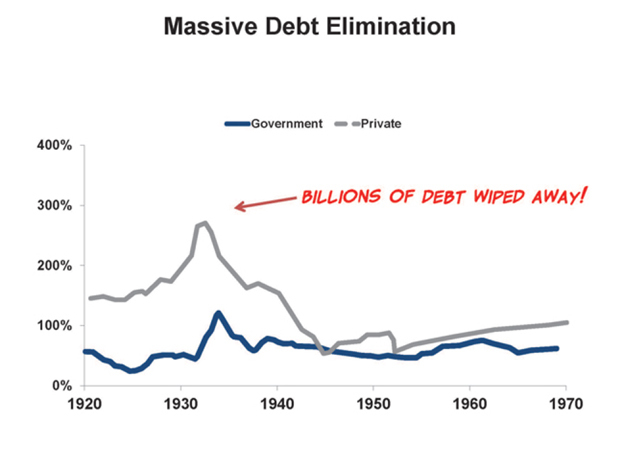 Sooner rather than later, massive amounts of debt will need to be repaid or written off. Money and credit will dry up... again. The financial asset bubble will burst, much bigger than last time, and tens of trillions of dollars in wealth will disappear. Demand for all kinds of good and services will fall sharply… followed by falling prices. And falling prices lead to layoffs and falling wages. But as I've been telling you in this presentation, the opportunity will be huge if you're prepared. Not only to get rich from certain bear investment strategies and the small group of companies that will thrive in the coming years… but, as wages and prices fall and debt gets erased further, the U.S. dollar will strengthen and people with cash and streams of income will be richly rewarded. Our newsletter, Boom & Bust, will guide you in all of these areas. You'll know what's coming next… where the immediate opportunities are… and where to park your money for the longer term. We'll tell you when assets such as real estate have finally – and truly – bottomed out, in case you want to snap up bargains or ride the next real estate boom higher. In short, you'll have everything you need at your disposal to survive and prosper from the volatile times ahead. Best of all, you can look at our research, commentary, and recommendations at absolutely no risk or obligation. Take a full 45 days if you don't think we've done our job and you'd like a refund, let us know and we will refund you the remaining portion of your subscription. Please know that I'm not going to charge you an arm and a leg to see the work we do. I believe regular folks trying to protect their families and their life savings are the people who need our research the most right now. That's why the we’ve made the regular subscription price for a year of Boom & Bust ridiculously cheap. But if you sign up now, I'll see to it you only pay half the regular price. Plus, when you sign up I have a number of research reports waiting for you, so you can know exactly what to expect in the days and months ahead and where the best profit opportunities will be. 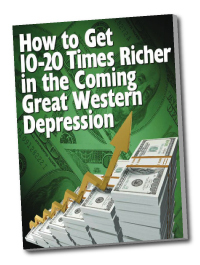 Research Report #1: How to Get 10-20 Times Richer in the Coming Great Western Depression. Consider this your “To-Do List” for profiting through the years ahead. Tops on the list: Trades to make to preserve your cash in the depression. 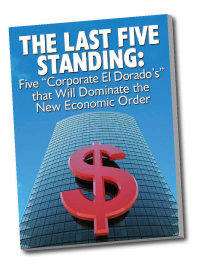 Research Report #2: The Last Five Standing: Five “Corporate Eldorado’s” that Will Dominate the New Economic Order. Winter Economic Seasons spell doom for thousands of poorly managed and bloated companies. But there is always a handful that not only survive such shakeouts but out-and-out thrive. I’m talking cash-rich companies who sell what’s needed in difficult times and who instigate a smart and aggressive strategy of expansion and market consolidation. In the ’30s and ’40s, companies like Procter & Gamble, Bethlehem Steel, Borg Warner and Skelly Oil (now Chevron Texas) delivered returns as high as 16,578%. In Last Five Standing we’ll tell you who we think the next shakeout winners will be to deliver 16-to-1 gains (or better) to anyone who gets in at just the right time. 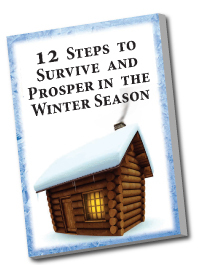 Research Report #3: 12 Steps to Survive and Prosper in the Winter Season. The key to successfully surviving and profiting from major economic and market shifts is to prepare for when they come. In this report, you’ll learn which assets you should be keeping and which ones you should be selling now… important cash strategies for making sure your money is safe from the many ways banks, governments and corporations will try to usurp your money to pay their bills… and how to organize your finances so you can be generating maximum cash and income, 24 hours a day. These three reports will give you the foundation you need to turn a classic "crisis" situation into one of enormous opportunity. Then, every month I’ll send you my monthly letter, Boom & Bust, to keep you on top of what’s happening now, what’s going to happen next, and the best ways to make money as everything unfolds. Plus, you can log onto our members-only website for updates and new opportunities, or sign up to get e-mail alerts from us at no additional charge. We’ll send these anytime we have something important to tell you. And remember, this is all 100% guaranteed. You have a full 45 days to decide if it's right for you. If at any time during your subscription period you decide our work isn’t right for you – simply let us know and I’ll see to it that you receive a full, prompt, and courteous refund of the unused amount on your subscription. No conditions you need to meet. You’re either thrilled with our work or you're eligible for a refund– and you keep everything you’ve received. I sincerely hope you’ll consider this offer seriously. As "on-the-money" as my research and forecasts have been in the past – about the '90-'91 recession, about Japan, and about the last bull market from '93-'97 – I’ve never been more certain about what’s ahead for America than I am right now. And given the tireless research I’ve done on the subject – and our history of successful forecasting in the past – I know we can help you prepare and prosper in the months ahead. To get started, simply click on the button below and you’ll be taken to a secure order form. Your order will be processed immediately and you’ll have full access to all our research… your first Boom & Bust issue… and all three special reports I mentioned. Thank you so much for listening to this important presentation. I promise you, it was time well spent… and signing up to get my Boom & Bust letter will be one of the best financial moves you’ll ever make. Because, while everyone else will be wondering what hit them, you'll have seen it coming in plenty of time… and you'll have a clear, profitable plan in place.